Pharyngitis or sore throat is a common issue usually caused by an infection. Sometimes, soreness is the only symptom of an infection in the throat, but it is possible to experience other issues such as mild cough, a hoarse voice, headache, fever, fatigue and swelling of the glands in the neck as well. Soreness in your throat can be so severe that you may not be able to swallow anything. This makes many people wonder how to deal with the sore throat that prevents them to swallow. While soreness usually goes away in about a week or so, you can take certain steps to make your condition more manageable. Sore Throat, Can't Swallow, Why? One of the most common reasons of developing sore throat is that you have caught cold. Other viral infections in the respiratory system can also lead to sore throat, hoarseness, cough, nasal congestion and other respiratory problems. Your sore throat may be due to an infection caused by the streptococcus bacteria. Being the underlying cause of sore throats in 10-20 % patients, the condition is called strep throat or streptococcal pharyngitis. You will need antibiotics to clear the infection. Young adults may develop soreness due to infectious mononucleosis. If you have this infection, you may also have other symptoms such as fever and swollen lymph nodes. No antibiotic treatment is available for this infection. In addition, you may have a sore throat due to other common causes, including post-nasal drip, smoking, dry air and yelling. In rare cases, gonorrhea and some other sexually transmitted diseases can cause pharyngitis. Add a teaspoon of salt to 8 ounces of water and gargle with it for a few seconds. Be sure to spit it out after you have gargled for a few seconds. This will soothe your irritated throat and help pull the mucus out of your inflamed tissue. Look for OTC throat lozenges with menthol. These lozenges work mainly due to menthol that numb the tissue in your throat and relieves soreness. 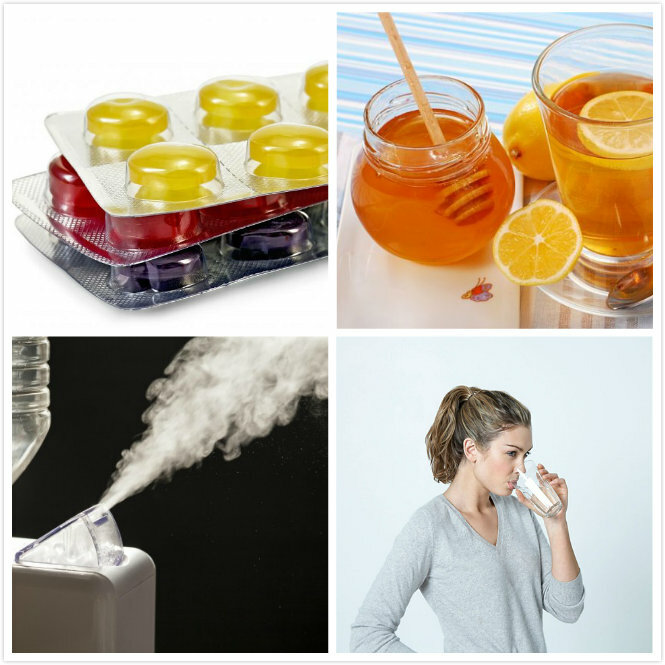 You can also try cough drops or peppermint candies to relieve burning and pain sensations. While cough drops do work, their effect will not last longer than lozenges. Do not give cough drops or lozenges to young children to prevent choking. You need to drink plenty of water and other beverages to keep yourself from feeling dehydrated. If you become dehydrated, your body will not produce enough mucus and saliva, which in turn will aggravate soreness and irritation in your throat. Sore throat, can't swallow? Try honey tea! A cup of tea that contains honey will help soothe your irritated throat. It also helps keep you hydrated and suppresses cough as well. Install one if you do not already have it in your home. A humidifier really helps when you often deal with throat soreness or have allergies. Breathing in moist air goes a long way in relieving swelling and soreness. If you do not have a humidifier in your home, do not worry. Try steam inhalation instead. Simply run very hot water in your sink, bend over it, and take slow, deep breaths. Similarly, you can take a warm shower and let the water run for a while before stepping in the bathroom. Take deep breaths to ease sore throat. Along with lozenges, you can also take OTC medicines to treat throat infections. If your sore throat is due to a viral infection, antibiotics will not work. You can take OTC medicines to treat the symptoms while your body clears the infection on its own. You can take anti-inflammatory medicines such as Aleve or Advil to reduce swelling in your throat. Ibuprofen is also effective, but you should avoid it if you have a kidney disease or stomach problems. Antibiotics are not going to work if you have a viral infection. Your doctor may order a test to confirm if you have a bacterial or viral infection. Even if you have a bacterial infection, you do not always need to take antibiotics. In most cases, you just have to follow some home remedies, take OTC medicines and get enough rest to let your immune system do its job. Taking antibiotics may accelerate recovery, but you may have to deal with certain side effects, such as rash, diarrhea, feeling sick and stomach upsets. However, your doctor may decide by having a closer look at your sore throat first. They may decide to give you antibiotics if you have puss on the tonsils, tender lymph nodes high temperature. You feel very sick or weak. You have a fever of 103 °F or higher. You notice signs of dehydration, such as dry mouth, lightheadedness, etc. You have difficulty swallowing and cannot even open mouth completely. You have severe pain in your throat. You have pus in the back of your throat with fever. You have sinus pain with earache. It is important to consult with your doctor if your sore throat lasts longer than 4 days, your fever persists for 3 days, or you have a history of having rheumatic fever. If you have been exposed to Strep in the past couple of weeks, be sure to contact your doctor immediately after having a sore throat. Moreover, people with compromised immune system due to cancer chemotherapy, HIV positive or chronic steroid treatment should not take sore throat lightly and seek immediately medical attention. What Happens If There Is Too Much Carbon Dioxide in Blood?